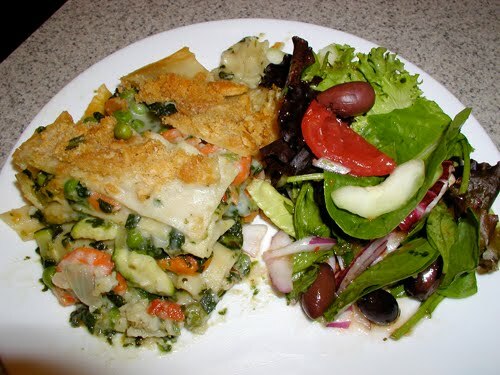 Yesterday, mom had a taste for some white veggie lasagna and Greek salad. We bought the fixin's this afternoon, and I later set my Veganishta magic into action. I had to make another, marinara with cheese stuff version, lasagna for the hubby, however. I took my time and captured some shots of the birthing process. I'll post a couple here. My creations are always a work in process, as I now know after this evening what to add a little more of or a little less of, but nonetheless, it was still delicious. Alfredo had a great time too. 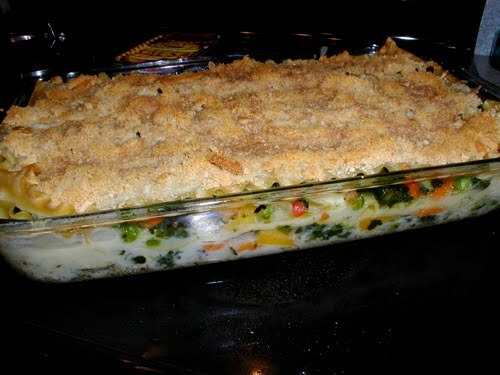 I used some frozen and some fresh veggies: zucchini, carrots, red bell pepper, onion, garlic, spinach, and peas. I made my white sauce (the one that I usually add the cheddar vegan cheese to for mac and cheese) and added a bit of Italian Seasonings. Of course I sauteed the onion and two large cloves of garlic in some olive oil beforehand. I spread some olive oil on the bottom and sides of the glass baking dish (just a very thin layer), added some sauce, then sprinkled a couple of small handfuls of grits—yes, grits, on top of that. My way of keeping foods and sauces from sticking works really well, and you can end up with a flavorful polenta on the bottom of the masterpiece to enjoy! It works better than corn meal, which just turns hard and burns. While typing this posting, I just realized I forgot to add the mushrooms. Geesh! Next time for sure I will add some of my gourmet mushrooms (from Costco–in a large container and freeze dried). Salivate if you must. I know my tummy's about to bust. YUM! This looks really great!